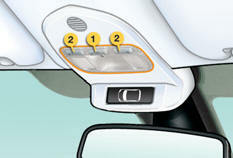 - when the remote control locking button is activated, in order to locate your vehicle. - 30 seconds after the last door is closed. 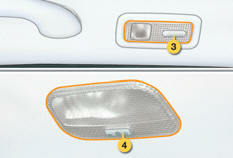 When the front courtesy lamp is in the "permanent lighting" position, the rear courtesy lamp will also come on, unless it is in the "permanently off" position. With the ignition on, press the corresponding switch. With the ignition on and the switch pressed, the reading lamp comes on in "permanent lighting" mode. It goes off on switching off the ignition or if the switch is pressed again. - when the remote control locking button is pressed, in order to locate your vehicle. Pressing the switch changes to "permanent lighting" mode.